This entry was posted on October 17, 2011 at 9:41 pm and is filed under Ethics-general, Government, hypocrisy, Media, Politics. You can follow any responses to this entry through the RSS 2.0 feed. You can leave a response, or trackback from your own site. I’m not sure the 999 will work for the poor, and a lot of us are poor. I think it works only for people who earn well over $100,000. It works like magic for the very rich. Well I think it screws the small business man!!! I gross 600000 from business but I pay 75% of money to employees in terms of wages, plus I pay taxes, work comp and other business expenses and turn on average over the years a 9k profit or less. So this joker is telling me that I better have 70K ready to pay even before I have to pay 9% on my personal income which comes from my LLC income / profit pass through???? Oh hell nah!!!!! 999 tax plan will put me in poor house after my business goes belly up!! 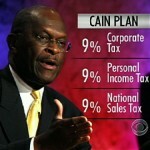 IF he allowed business expenses with this plan then I would take less of a hit! !